Making travel dreams come true! 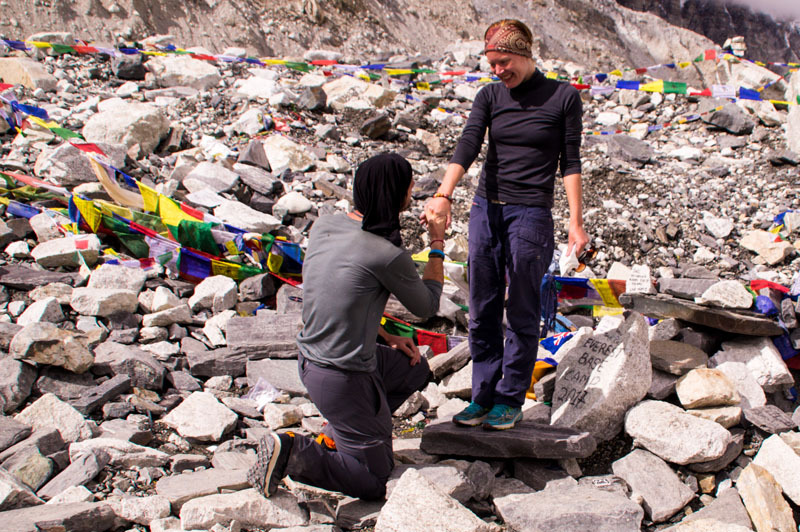 Everest Basecamp, where we got engaged! You are here: Home / Asia / Nepal / Everest Basecamp, where we got engaged! Everest Basecamp Trekking is going to be our first big adventure in Nepal. 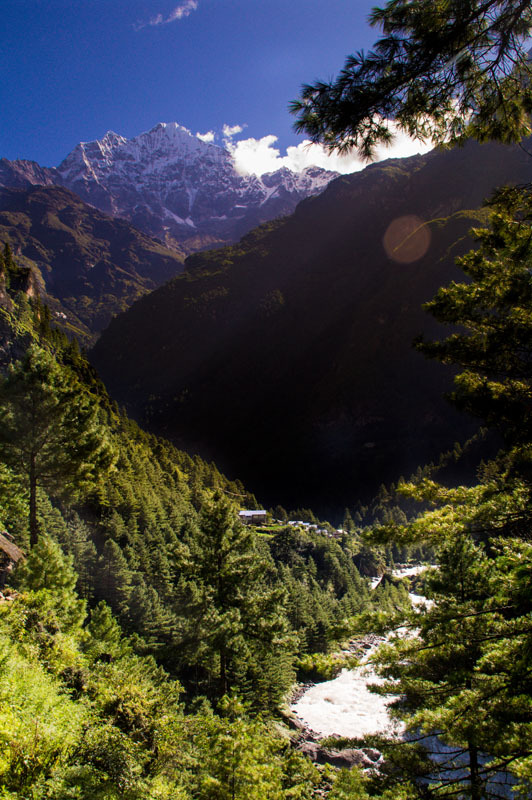 The Everest Holiday arranged everything perfectly and also on a super low budget. 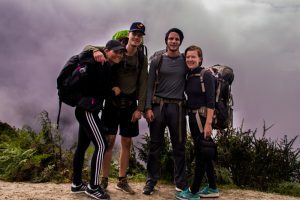 For only 450 dollar per person (they prefer telling you high amounts in Dollars, so it doesn’t immediately scare you off I guess) we leave for Everest Basecamp, together with another Dutch couple, Yannick and Winnie, and a local guide. This is very, very cheap. The lowest offer I got from other travel agencies was 950 dollar per person. So off to Everest Basecamp! 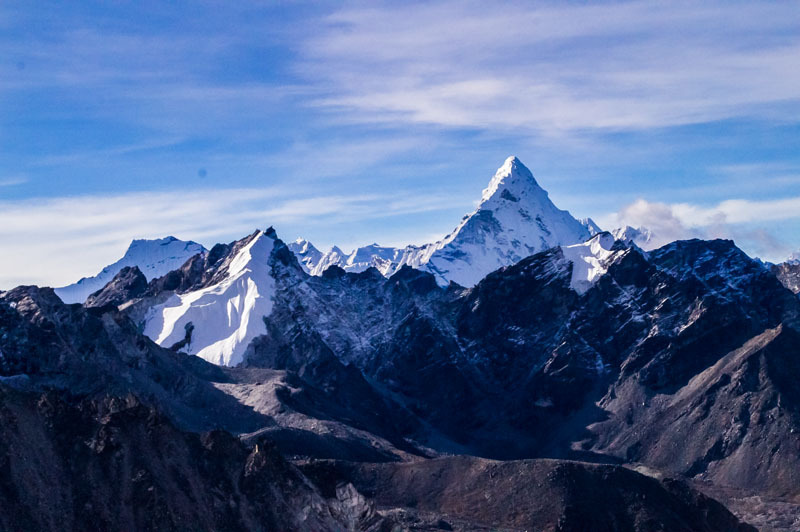 One of the highest places you can get to without any climbing skills on the highest mountain of the world; Mount Everest. On the first day we have to get up at 4.45 am to be in time for our 7.45 am flight from Kathmandu to Lukla. At our guesthouse we have a big breakfast and we’re on our way to the airport by 6 am. This is Kathmandu’s only airport, so our small, national plane is right in the middle of all the huge intercontinental airplanes. It’s also the smallest airport we’ve ever seen, especially in a capital city. To get into the departure hall of the small, brown building we have to walk through the scanner, where no one really pays attention to what’s going on. We even had our phones in our pockets and nobody said anything. Scanning the bags is the same thing. They have the machine, but the person operating it is too busy on his phone. But we are in, that’s all that matters. In the crowded departure hall it’s hard to find out which of the doors leads to our gate. 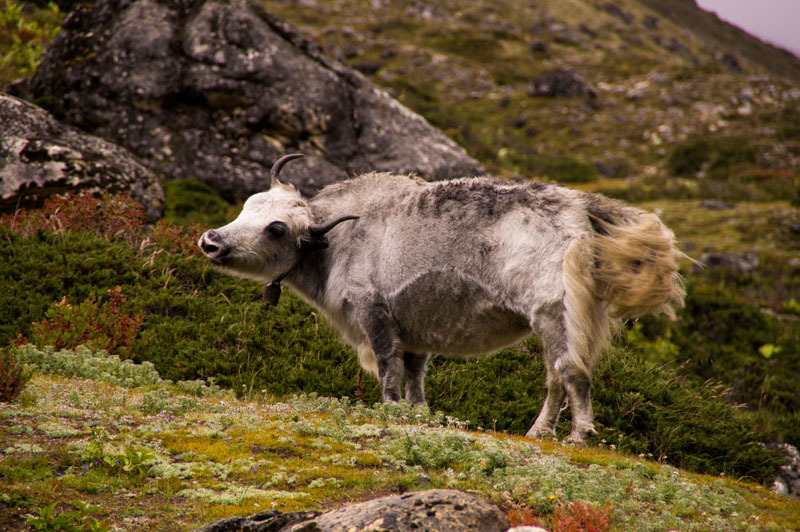 There are no signs whatsoever, so when we hear someone say ‘Lukla’, we jump up and walk through the door. It takes 3 checks for the staff to find out that our tickets don’t match with this flight. So back to the departure hall it is. When it finally is our turn, it’s a challenge to find the right bus. People don’t speak very good English, but in the end we find someone that points us in the direction of two buses. We decide to take the left one, no idea if that’s the right one. Together with 10 other confused tourists we drive to our plane. This is quite exciting, because we have no idea which one will be our plane and we pass some that are in really bad shape. Luckily our plane looks pretty good, even though it’s very small. It can only fit 12 people, but on the bright side, everyone has a window seat. It’s a beautiful flight through the green, mountains of Nepal. We even see some snowy mountains in the background. 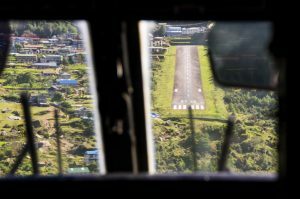 When we see Lukla’s airport we do get a little bit scared. 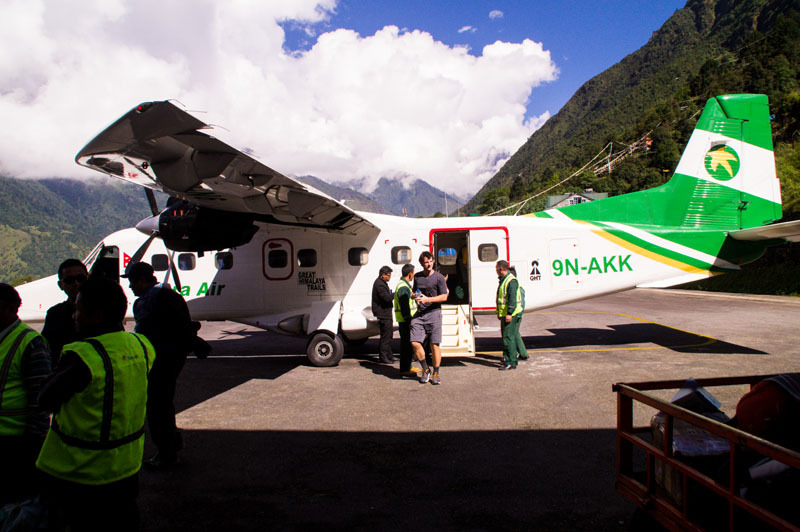 Lukla is an airport located at an altitude of 2845 meters with an angle of 12 degrees. There’s only one runway that’s being used for both landing and take off and this runway is only 450 meters long. At the end of the ‘landing strip’ there is high terrain immediately that rapidly comes closer after landing. At the end of the ‘take off strip’ it’s even worse. There lies a 700 meter deep valley. 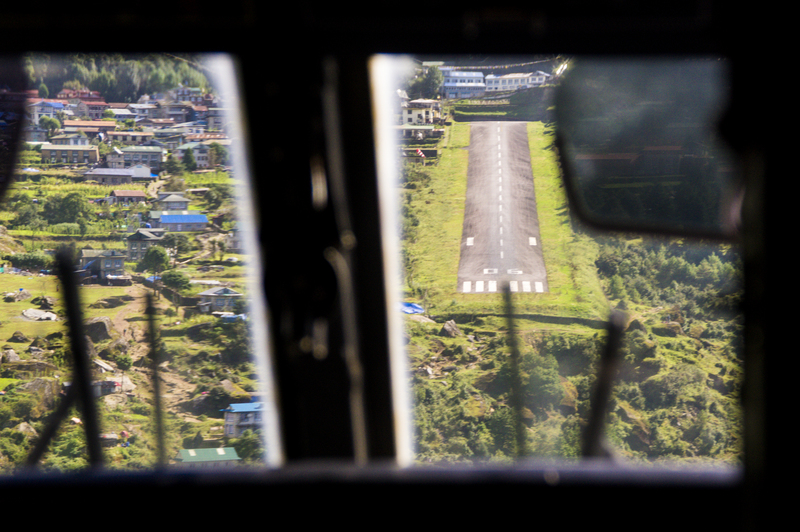 So when landing a plane at Lukla the pilot has to keep a sharp eye at his altitude. Too high means he will have less runway for braking. Too low means he will hit the steep cliff. And we didn’t even mention the weather at Lukla. Often it’s very cloudy there which is a reason for cancelling many flights and the wind is very treacherous as well for a successful landing. The airport got the nickname of ‘Worlds’ deadliest airport’. Our guide, Gopal, is already waiting for us at the airport. First we have some lunch at a nearby hotel, before starting our 3 hour track for today. 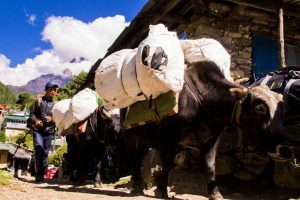 At our tour operator, The Everest Holiday, we chose a package without food or accommodation, which allows us to pick our own accommodation during the trek. This way we can keep good track of our budget. Food here at Lukla is already a bit more expensive than in Kathmandu, but we still have lunch for about 3,5 euros each. Along the whole track there’s Western food available like pancakes, omelets, toast, etc. We were advised to calculate 25 dollars a day per person, and this was more than enough. The higher you get, the more expensive everything gets though, and don’t forget that we were travelling in low season. 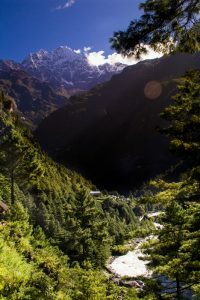 Our destination for today is Phakding, a 3 hour walk from Lukla and should be quite easy. We didn’t even need good walking shoes for this entire trek, according to our travel agency. And there was no lie in that, we could walk the track on trainers. Since we are here just after raining season and just before winter, we didn’t need waterproof or warm shoes. Once we arrive in Phakding, Gopal takes us to our first accommodation. For only 200 rupees (2 dollar) per room we have a private room with private bathroom. The water isn’t working, but hey, we weren’t planning on showering during this trek anyway. Apparently it’s quite dangerous to have warm showers when travelling above 3000 meters because it can shock your body and lead to serious illness. Although the room is so cheap the accomodation (and every accommodation we slept at during this hike) has a rule for eating out. You are allowed to eat out but when you do, you will have to pay double price for your room, or even more. During our trek the food at the accomodations was great so we didn’t feel the need to eat out once. Basically all the food is the same and once you arrived at your accommodation, you don’t want to go outside again anyway. After a nice garlic soup (which should serve as a remedy for altitude sickness, so we eat this every day) we take a rest in our room. Then it’s time to play some games that we brought along to kill time, have dinner and end the night with a cup of tea. We’re in bed at 7 or 8 pm. This is our standard program for the whole track. The higher we get the colder it gets, so you don’t even want to be anywhere else than inside once you’ve checked into your accommodation. Luckily we rented some down jackets and sleeping bags, because even though we walk around in t-shirts during the day, we already need the jackets the first night. At 5.45 every day the alarm goes off. Then it’s a quick facewash with cold mountain water, getting dressed, pack our bags and at 6.30 we have to be ready for breakfast which we pre-ordered the day before. While we have breakfast, Gopal fills up our water bottles and we add a few drops of chloride to the water for purification. We bought these in Kathmandu for only 50 cents at the pharmacy, and after 30 minutes you have perfectly clean drinking water. The small bottle is more than enough to purify water for 3 months. At 7 it’s time to leave. 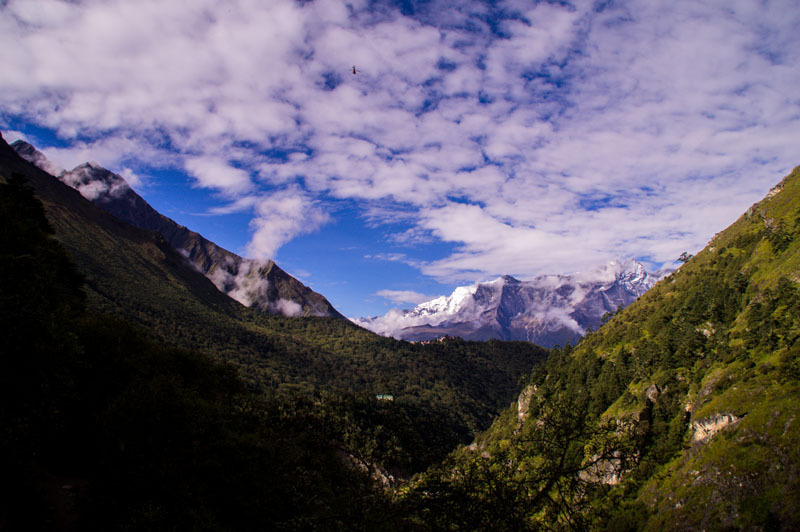 Today we are going to Namche, where we will stay for 2 nights to acclimatize. During our ‘rest day’ we climb up a few hundred meters to see if anyone gets altitude sickness symptoms. If that’s the case, we can stay one more day in Namche to reduse the symptoms. We were already warned that the second day was going to be the hardest, and there was no exaggeration in that one. When leaving the village the track is still ‘flat’. Although, we have a different opinion on flat than our guide does. When he says it’s flat, it basically means we’ll be at the same altitude when the ‘flat’ part is over. If there’s a huge hill in the middle he still calls it flat… Luckily today the first part goes down to a river. We follow the river for half an hour and then it’s up to a bridge, 100 meters above the river. After the bridge it’s another 2 hours up and the last part finally really is flat. The up part is really, really tough with our heavy backpacks and excessive amount of water. 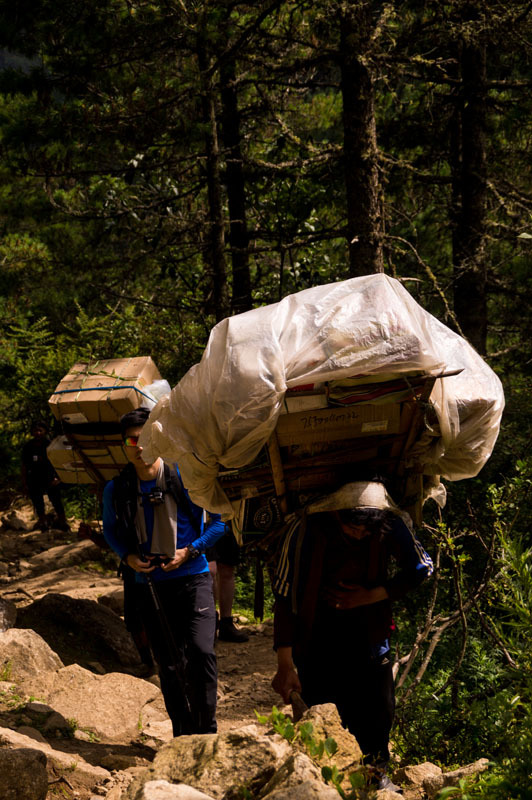 It’s amazing to see how the many porters walk up fairly easily here, carrying 3 backpacks each or a basket full of boxes with whiskey bottles and snicker bars. Luckily we took some snacks from Kathmandu to boost our spirits every once in a while. You can also buy all kinds of snacks along the track but they are quite expensive and get even more expensive the higher you get. Which does make sense if you think about it, since a porter has to carry them all the way up there. After the 2 hour long ascent we sit down and eat some Oreo’s, after that our energy levels are back up and we’re good to go. Gopal is sweet enough to lie to us about the remaining trekking time. If he suddenly tells us it’s only 20 minutes we are very excited and when we arrive after just 5 minutes, we’ve never been happier. In Namche we stay at ‘The Nest’, again for 200 rupees per room. This time with a shared bathroom in the hallway. A bathroom here is nothing like the one we Western Europeans are used to back at home. They hardly (or never) get cleaned and you really don’t want to go in there without wearing your shoes. Sitting down is often impossible because the seat is always wet. Make sure you bring enough toilet paper and tissues, because that’s not a thing here. Also if you have to buy it on the track, it will be very expensive. One roll of toilet paper can easily cost you 500 rupees. Basically, you have to be lucky to find a ‘normal’ toilet, because many times a ‘squat toilet’ (hole in the ground with footprints next to it) will be your only option. Our worst toilet experience was on the track, behind a local house. There was a small wooden shed with a big hole in the floor through which you could see the droppings of every person before you, with a little bit of hay on top. Can you imagine how it smelled in here? The pile of droppings and hay is actually in the backyard of the house and it will be reused as fertilizer for vegetables. So basically we eat vegetables that have been grown on our own poo! You can also forget about being able to wash your hands, so taking a hand sanitizer is a good idea. After every 600 meters ascend, you have to take an acclimatization day to get used to the altitude and to see if you don’t get sick. If you get symptoms like headache, insomnia, stomach ache, chestpain, loss of appetite, fever or muscle or joint pain, they can easily fade away after a day of rest. 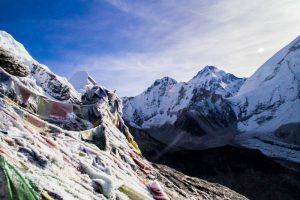 Unfortunately most tour operators are only thinking about making money and sending as many people up the mountain as possible in a short amount of time. So the tours are so packed that there is hardly time for you to have a rest day and acclimatize. Instead they sell you medicine that should prevent altitude sickness. Not a bad thing but certainly not the way to go. So if you are booking a trek make sure to ask if there are rest days included as well and if, worst case scenario, your flight back to Kathmandu can be delayed a few days. 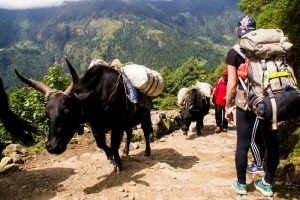 At The Everest Holiday they adjust every trek to your personal experience and preferences, including plenty of rest days, so this is the way to go. Perfect for beginners that don’t know how they will respond to the altitude and might need some more time. Our guide told us so many times that we had to walk slow to prevent altitude sickness. Not that we were able to keep up with his pace anyway, haha. 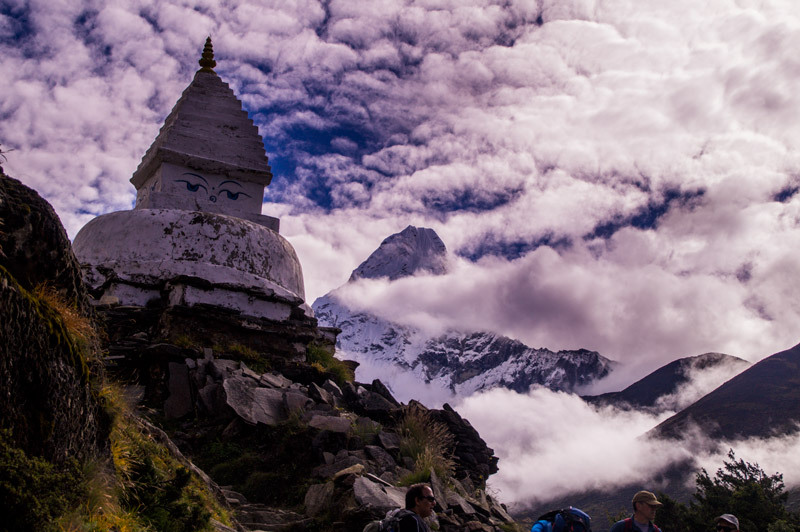 During our day of rest we walk up to Sagarmatha National Park, where there are a few statues. 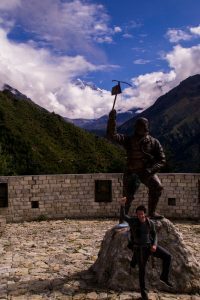 Among them is this one of Sherpa Tenzing Norgay, the sherpa that climbed Mount everest together with Sir Edmund Hillary in 1953 and made it to the top. There’s also a small museum about the park, in which Mount Everest lies, where you can see the flora and fauna of the park. From the park you have a perfect view on the very first snowy mountains and if the sky is clear you can even see Everest for the first time. Unfortunately for us most of the peaks are hiding in the clouds, but we do get to see a glimpse of Lhotse (8516 meter), number 4 highest mountain in the world. Shortly after this more clouds appear and all mountain tops are gone. We climb further up to the Everest View Hotel, but unfortunately we’re now fully in the clouds and we don’t get to see Mount Everest today. We feel a little bit sad, because the 1,5 hour climb up here was not totally worth it without a rewarding view. Luckily the way down is a lot easier, although we arrive in Namche with shaking legs. 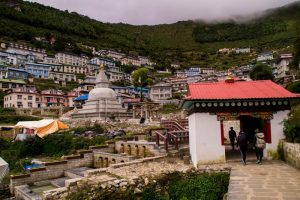 Namche is a very nice and cosy, touristic village and it’s definitely worth it to stay here an extra day. There are many small shops with colourful hats and clothes that give this village the typical Nepalese look. Put some yaks and adorable kids in the picture, with some mountains and waterfalls in the background and you have the perfect image. Today we walk to Debuche. Unfortunately the girls are pretty much done, but the guys are so sweet to take most of our stuff out of our backpacks and into theirs. The first half hour we are doing the same climb as yesterday and thus we are not looking forward to it. Especially not since we are carrying our backpacks now. Luckily after that it’s 45 minutes flat and then 2 hours down until lunch. This last part is actually even worse than the first part up. It’s very steep so all our muscles hurt from trying not to slide down. And they were actually still sore from yesterday. In the meantime our eyes start to hurt from focusing really hard on where to put our feet, because it’s a very rocky road. Gopal let’s us take plenty of breaks and even doesn’t complain when we want to take even more breaks. The weather is also finally nice today and with the sun out we get to see some pretty nice views. After lunch we have regained some of our strength and start our 2 hour ascent to Debuche. Debuche is a bit more expensive and a lot of the accommodations there are already fully booked. Our guide suggests to continue our walk for half an hour, downhill, to find an accommodation for the price that we’re used to by now. This accommodation is on the way so that means we have to walk less tomorrow. It has begun to rain a little bit and I’m not feeling so well. My stomach and head hurt and I’m feeling a bit nauseous. Another thing is that I’m feeling hot, even though it’s not that warm and my arms even feel quite cold. Luckily for me our guide knows a lot of people on the track and we run into his cousin that is kind enough to carry my backpack the last half an hour. The descent makes me feel a bit better, even though I am not really expecting to have symptoms of Acute Mountain Sickness (AMS) at an altitude of 3734 meter. It’s probably just fatigue. After all I’ve been walking more days in a row than I have ever done before. Our accommodation for today is Paradise Lodge and this is the first time that we feel cold upon arrival. Unfortunately the fireplace will not be lit until 4/5 o’clock, so our down jackets are a real treat. One hour of sleep underneath 2 thick blankets helps me a lot and I am even starting to feel hungry. The prices of food have gone up slightly and a hot shower is even priced at 500 rupees. Good thing we decided not to take any showers during our track. A meal is around 600/700 rupees each and a big pot of boiled water has gone up from 100 to 250. We have brought our own tea, honey and lemon so we only need to buy boiled water to have a nice warming tea, which is always the cheapest option. Today our track goes to Dingbuche located at an altitude of 4410 meters. Since we are getting higher, there is less oxygen in the air and our energy levels went down drastically. Luckily the distances between the villages are getting shorter as well. It seems as if we are getting used to all the walking though, because it hasn’t been as tough as our second day, at least up until now. After about 2,5 hours we reach the lunch restaurant but we don’t feel that hungry yet. Still we decide to have some food because there is a 2 hour climb ahead of us. Now it’s Winnie’s turn to collapse. Before lunch she didn’t have any symptoms and we discussed about skipping lunch and continue. But once we sit down her appetite is completely gone and her stomach is giving her trouble. We extend our break a bit, but at some point it’s time to get going. After all there is no one here to carry us up, we have to do it all ourselves. By now, Yannick is carrying 2 backpacks and Winnie gathers all her strength to make it to the final destination for today. Once we arrive at the Good Luck Hotel she starts feeling better. The room is 250 rupees per night but has a private toilet. We are lucky to get a room, since the hotel is almost fully booked. We rest for a bit, play some games before dinner in the cozy, warm restaurant and after dinner and tea it’s early bedtime again. Riny has had his first sleepless night, which is not helpful with such a long trail ahead. But he mans up and we arrive in Lobuche without any problems. In Lobuche finding an accommodation works a bit different. At the entrance of the village there’s some sort of toll booth where you have to pay 500 rupees per room, regardless which accommodation you’re staying at. So the cheapest accommodation you can find here is at least 500. If you book a more expensive one you will have to pay extra at the accommodation. We go to our room to get some sleep since Riny is totally beat right now. After having slept for an hour it’s time to get up because Riny and Yannick are going for a walk with the guide. It’s also not the best idea to sleep a lot during the day because it leads to lots of trouble sleeping at night. 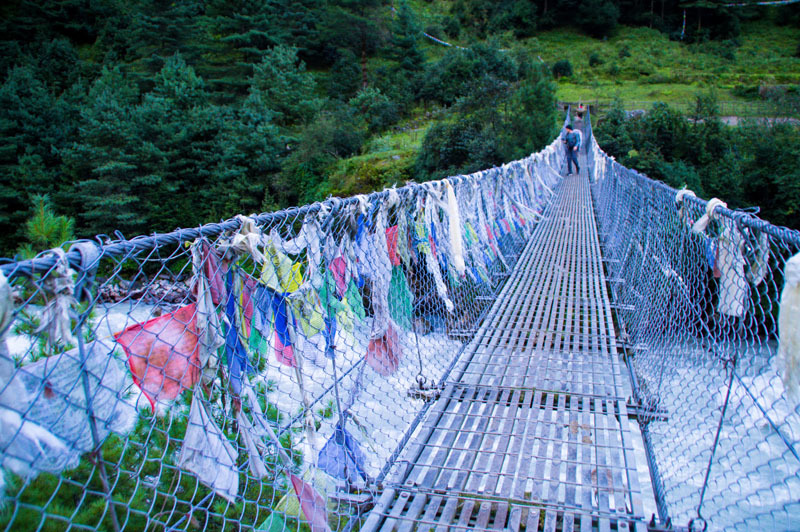 The walk is short, roughly 30 minutes, and leads to a viewpoint on the Everest glacier. Unfortunately there’s no glacier right now, only during winter. The glacier valley is nice to see but the mountain tops are all covered in clouds. We walk for half an hour over the mountain ridge before heading back to the hotel for dinner and hopefully a good nights rest for everyone. It’s already a lot colder here! Riny has had his second night of poor sleep and the rest of the gang also didn’t get much sleep. Luckily today is our last day of ascending. We decide to take it easy because the guide is worried about us and we would like to make it all the way to the top. We are so close now! I take back a few of my things from Riny’s backpack and after about an hour of walking, Gopal takes over his entire backpack. Even though that makes a huge a difference he’s still not feeling too well. His energy level is almost negative and his headache will not go down a single bit. His head even hurts when moving his eyes. This morning he even took a painkiller for migraine and a tablet for altitude sickness. For the people that know Riny, this is something he never does! I have never seen him take a single pill in the 4 years we’ve been together… So yes, I am a bit worried about him. 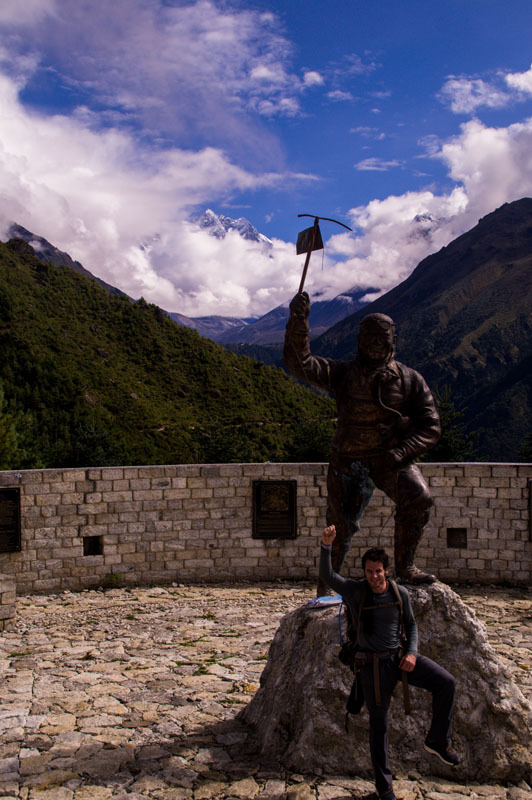 On the way to Lobuche we come across a memorial for the sherpas that gave their lives trying to climb Everest. A sherpa is someone from the local Himalayan people who guides and accompanies a mountaineer on his (or her) expedition to the Everest peak. They are perfect for this because their genetics give them a much less change to get altitude sickness and they are experts on mountaineering and know the area very well. A very impressive memorial. You can’t imagine how many people gave their lives trying to climb the worlds highest mountain. 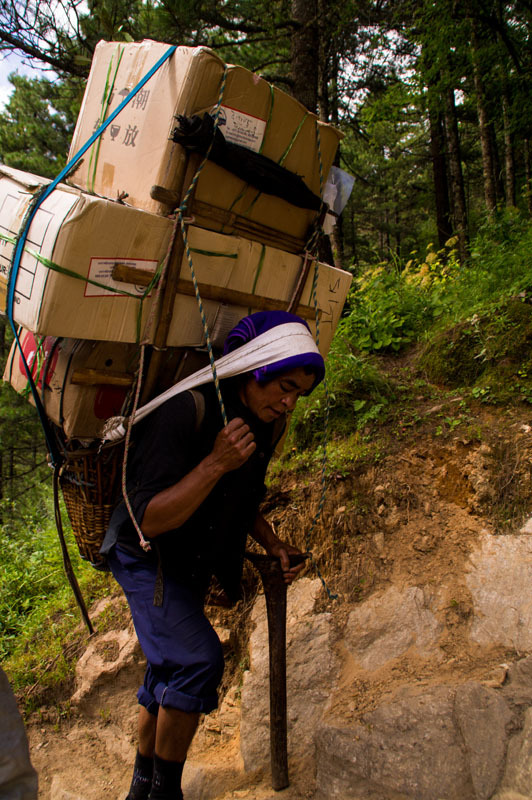 Despite the risks, many people still try every year, always accompanied by a sherpa. 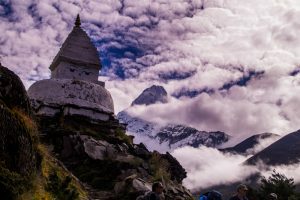 It’s good to see that the sherpas also get some attention, because they hardly ever get mentioned when someone reaches the peak. When we arrive at Snow Land Highest Inn at Gorak Shep we order a huge lunch, hoping that makes Riny feel better. After all we still have to get to Everest Basecamp today and it’s at least 3 hours up and down. The sun starts to shine and by the time we leave the clouds went pretty high up. Finally we have some view on the mountains surrounding us. We can still not see the peaks, but at least we see something. It’s so beautiful! We even see some huge gletsjers between the mountains on our way to Basecamp. We made it! Everest Basecamp! 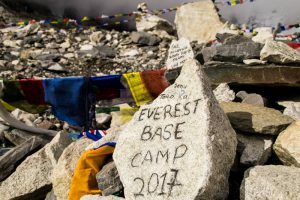 Everest Basecamp is in fact no more than just a stone that says: ‘Everest Basecamp 2017’. Every year the Basecamp is moved to a different spot and it might even change on a daily basis. Because the area where Basecamp is located is on a glacier and thus constantly moving and changing. To keep it safe for all the tourists that gather there they change it to a safe spot if neccessary. Our guide also advises us to not stay at Basecampp for more than 10 minutes, but for us this is a once in a lifetime experience so we kind of ignore his advice. I’m giggling like a little schoolgirl when Riny proposes to me at this perfect spot. That line and his cute smile are engraved into my memory forever! Is my answer that I scream out loud and then we hug and kiss. Instead of a ring I get a beautiful bracelet with 13 colored stone hearts, which I have picked myself without knowing in Georgetown, Malaysia. But he has to get on his knees to put the bracelet on because he forgot to get down on his knee due to all the nerves, haha! I thought it was a bit suspicious when Riny asked Yannick to film with our camera. Could I have known then? A part of me does think so, because it’s THE perfect spot for this special moment, especially since it was so incredibly difficult to get here. This is a true victory for the both of us and I haven’t been cutting him some slack along the way. Another part of me doesn’t think so because an obvious place is not Riny’s style, he likes to do things different. In his own way. But I’m thrilled that he chose this place. It might be a bit of a cliché amongst Everest climbers, but it’s o so beautiful! I wouldn’t have wanted it in any other way! We take some more pictures and then we had back towards our accommodation. Fully satisfied we crash down on a couch in the dining area around 5 o’clock. 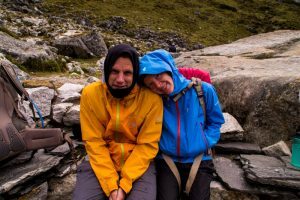 We are exhausted by this long trail and emotional moments and tomorrow is another heavy track up to Kala Patthar to see the sunrise over Everest. Kala Patthar is a viewpoint that gives a 360 view over all the mountain tops, located at 5648 meters high. The highest point this track to Everst Basecamp offers. To be in time to see the sunrise we have to get up early though, so we go to bed straight after dinner and Gopal will wake us up when it’s time to go. We are literally waiting for Gopal’s wake up call, because once again all of us barely get any sleep. It’s so cold up here and because Gopal advises us to drink a lot (to prevent Altitude Sickness) I have to get out of bed a few times a night to pee. And the minute your feet hit the ice cold floor you’re wide awake! Gopal is sweet enough to wake us up when Mount Everest is visible, because if it remains cloudy there is no need to make the ascent. He’s been on the lookout for Everest since 3 o’clock and by 4.45 it’s time for us to head up to Kala Patthar. From the bathroom window I see some nice snowy mountaintops underneath a bright sky full of stars. We get dressed as fast as we can and gather our gear. It’going to be a 2 hour walk and there’s no time for breakfast so our remaining snacks will have to do the trick. Riny and Yannick. They seem to have less trouble getting up the mountain and they might be just in time to see the sun rise over Everest. Like said before, there is so less oxygen up here that ascending is almost undoable. We move so slowly that it seems we are going backwards and then still we need a small break every 2 minutes and a longer one every half hour. The higher we get the colder it gets and this is the first time that our shoes don’t provide enough comfort against the cold. But we do manage to overcome the frozen rocks and eventually reach the summit. The view we get up here is astonishing and the weather is perfect. Clear blue sky and sunshine and the first clouds start to form around the snowy tops by the time we get back to the hotel. This had to be our destiny! We were quite unlucky during the track without even a glimpse on Everest, no we have the whole shebang! Someone tells us that this is the best day they’ve had for the past 2 months. 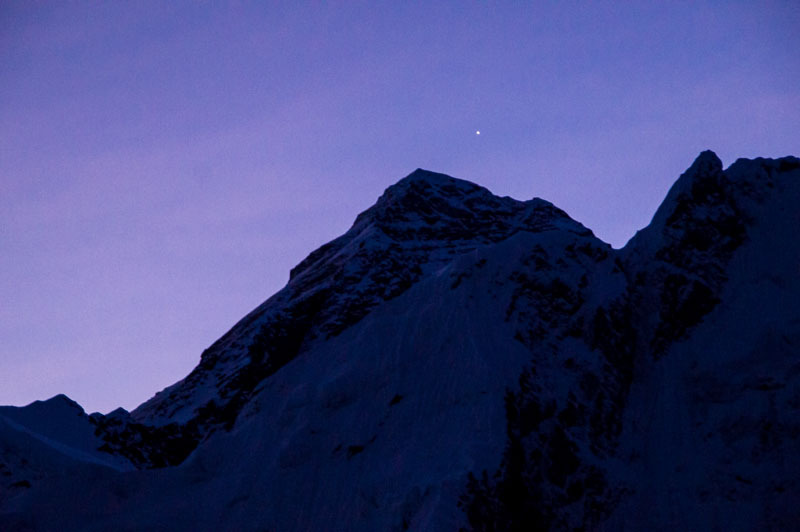 We all thank the bright star that could be seen right above Mount Everest when we started our journey this morning. For each and everyone of us, this star symbolized a different person, but I’m sure that all of them helped us reach the summit and made this beautiufll weather happen. I can’t express in words how special that feeling felt and I think it’s hard to imagine even how extraordinary that feeling is. For the first time we feel truly priviliged to be able to do this. Normally during our travels we often think that everyone can do this if they truly wanted to. Now we are convinced that this isn’t just something everyone can do. Physically, mentally and financially this is a real obstacle to conquer. We feel very lucky to live in our country, with our loving family surrounding us and being blessed with how our lives have taken their turns. A good moment to be thankful and grateful for all that! Once we get back down to the hotel we don’t feel that good. Our appetite is gone, the headache is still present and we are exhausted. Riny feels a bit disoriented and very nauseous, so our guide’s advice is to not walk 3 days back to Lukla, but to have someone call our tour operator and arrange a rescue by helicopter. Since we’ve been having Altitude Sickness symptoms for a few consecutive days now the risk is too big. 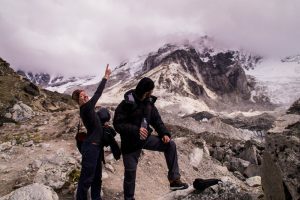 We didn’t really know beforehand, but altitude sickness can even be lethal if not treated appropriately. Make sure to check your insurance before you book any trekkings and ask your tour operator about their rescue options. Luckily we booked with The Everest Holiday, because they partly own the chopper and the hospital. We are confident that we get the best care possible and they don’t overcharge Riny’s insurance. After a couple of hours there’s a small chopper landing to take us back to Lukla. The weather is starting to get worse in Gorak Shep and once we make it to Lukla it’s obvious that we were really lucky. Our helicopter pilot tells us that this is the last flight out of Everest Basecamp for today. We take a seat in a hotel close to the airport where we force ourselves to have some lunch. The clouds are really starting to build up by now and by the time our lunch is served we are unable to see the other side of the airport anymore. 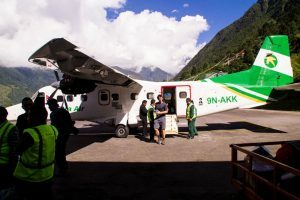 Our guide comes in to tell us that the helicopter that is taking us to Kathmandu had to make an emergency landing somewhere else due to poor visibility at Lukla. He has landed the helicopter about 10 minutes flying distance from the airport and he is waiting for the clouds/fog to disappear. About half an hour later the visibility has increased a bit and the helicopter finally arrives. We get up from our seats and take our bags to the helicopter. We’re happy when we can finally sit down in the heli. After the shock of taking off in, for us, poor visibility we can even enjoy the flight a little bit. We have a beautiful view on Nepal. It’s so strange to see how little roads there are in this part of the country, all the way till the suburbs of Kathmandu. It must be impossible to travel around by car in this country. And still people live at the most remote places, for example on the side of a mountain with no neighbors in the first 10 kilometers. We see many beautiful terraces, built on the mountain, and waterfalls. We’re pleased to land safely in Kathmandu, because it was a little bit scary every once in a while. I feel a lot better already butto be on the safe side Riny gets himself submitted into the hospital. The next day we hear that he’s fine and we can go back ‘home’ to our Nepali family. It’s not a regular homestay, but the Simkhada family takes very good care of all their guests (friends, really). Making new friends is more important to them than making money, so the house is always full of foreigners. The perfect stay in Kathmandu if you want to live with the locals for a while and have the best Nepali food ever. Also The Everest Holiday arranges any tour you’d like to do perfectly and at the best rate possible. If you’d like any info on the homestay or tours and tracks you can always check their website or contact us here or on our Facebook page. You can stay in the homestay for 10 dollar p.p., including 3 meals a day. on a sidenote, all the money they make at the homestay goes to help out children at the school where mom is principal. You can also volunteer at this school or one of the many other projects n Nepal. Let us know if you’re interested and we can get you into contact with the Nepali that arranges this at the lowest costs. Our pictures of this beautiful trekking you can find here. 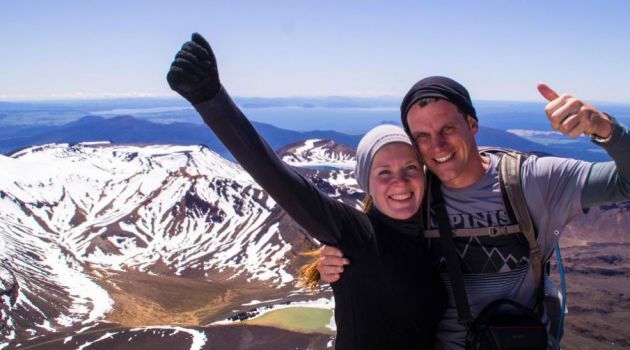 The photos and videos of our Dutch travel buddies Yannick and Winnie you can find on their Facebook page, Wy zijn op reis or their Youtube Channel. They have a really nice video of this trekking online already. Make sure to click on the pic to get the large version of this mindblowing picture! Subscribe to not miss a single story.